This three bedroom bungalow features a living area furnished with comfortable sofas and a fireplace. Entertainment is provided by satellite TV (limited channels), DVD player, CD player and a selection of board games and books thoughtfully provided by the villa owner. An archway opening leads into the dining area furnished with a dining table and chairs that comfortably seats 6 and patio doors that lead directly to the pool terrace. The kitchen is equipped with an electric oven and hob, fridge/freezer, microwave and washing machine. The villa has wireless internet connection. A hallway leads to the two twin bedded rooms both with patio doors opening on to the front terrace. These two bedrooms share the full family bathroom located across the hallway. A separate hallway leading to the master bedroom suite, past the en-suite shower room and separate dressing area with fitted wardrobes, opens into this double bedded room also with patio doors that open on to a terrace. The villa is equipped with ceiling fans throughout and portable fans are available in the living and dining area also. Air conditioning units are available only in the bedrooms and is included in the cost of the booking. A baby cot and highchair can be provided on request for a small charge, please contact us for further details. Outside the large 10m x 5m (depth 1m to 1.9m) swimming pool with walk-in steps is surrounded by a paved terrace set with 6 sunbeds and bordered by colourful flower beds. A table and chairs set on a covered veranda together with the portable gas barbecue ensures that great summer activity of dining al fresco can be enjoyed whilst admiring those stunning sea views and sunsets. 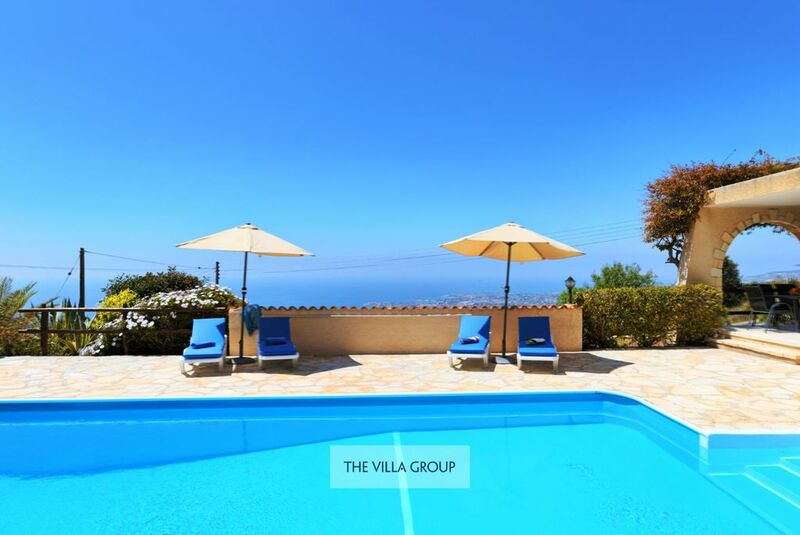 From the pool area and front terrace of this charming bungalow you can enjoy fabulous, far-reaching views over rolling countryside, down to the coastline stretching from Paphos to Coral Bay and further north towards Akamas, also taking in the Akoursos Dam and village of Peyia below.